75th Street–Elderts Lane (formerly 75th Street and originally Elderts Lane) is a skip-stop station on the BMT Jamaica Line of the New York City Subway. Located at 75th Street and Jamaica Avenue in Woodhaven, Queens, it is served by the Z train during rush hours in peak direction and by the J train at all other times. Both platforms have beige windscreens and brown canopies supported by green frames and support columns along their entire lengths except for a small section at the south end. Here, they have black steel waist high fences with lampposts at regular intervals. In the late 1980s, the Elderts Lane end of the station had a mezzanine area, but it was closed, and had become a haven to drugs and prostitution, so the staircases to the south end of the station were removed. When it was found that people were still getting into the closed mezzanine, the entire mezzanine area was dismantled, leaving the only exit and entrance to the station on the north side (75th Street). It was reported in Newsday on February 20, 1988 that the mezzanines at Elderts Lane, Forest Parkway and 104th Street stations would be torn down. The 1990 artwork here is called Five Points of Observation by Kathleen McCarthy. It affords a view of the street from the platforms and resembles a face when seen from the street. This artwork is also located in four other stations on this line. This station has one elevated station house beneath the tracks. A single staircase from the east end (railroad north) of each platform goes down to a waiting area/crossover, where a turnstile bank provides entrance/exit from the station. Outside fare control, there is a token booth and two staircases going down to either eastern corners of 75th Street and Jamaica Avenue. There is no access from the Eldert Lane side of the station. ^ a b "TO OPEN JAMAICA AV. LINE. ; Nearly Two and a Half Miles Ready for Operation Tonight" (May 27, 1917). New York Times Company. May 27, 1917. p. 24. Retrieved April 21, 2015. ^ a b "Jamaica Avenue 'L' is an Old Story Already" (PDF) (May 31, 1917). Leader Observer (Queens/Brooklyn, NY). May 31, 1917. p. 1. Retrieved April 20, 2015. ^ a b Report of the Public Service Commission for the First District of the State of New York, Volume 1. 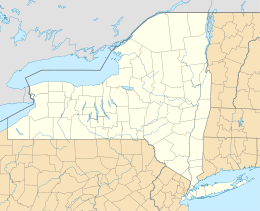 New York State Public Service Commission. January 15, 1918. pp. 73, 81, 312–314. Retrieved April 20, 2015. 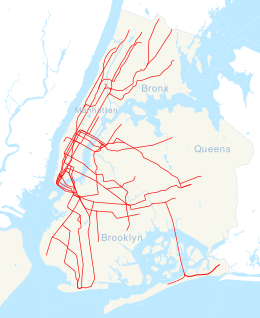 ^ "NYCityMap • DoITT • City-Wide GIS". 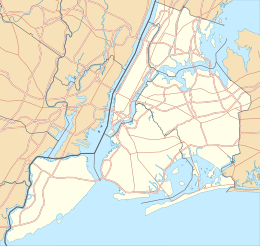 ^ "ELDERT LANE: BROOKLYN-QUEENS LINE | | Forgotten New York". "MTA Neighborhood Maps: East New York" (PDF). mta.info. Metropolitan Transportation Authority. 2015. Retrieved July 19, 2015. "MTA Neighborhood Map: Woodhaven" (PDF). mta.info. Metropolitan Transportation Authority. 2015. Retrieved July 22, 2015. Wikimedia Commons has media related to 75th Street – Elderts Lane (BMT Jamaica Line).